A few weeks back, when the summer in Delhi had still not bared its fangs, we were in Khan Market one weekend evening for a long planned visit to the excellent Full Circle bookshop, followed by dinner in the neighbourhood. And so it was that after the books were bought, we (self, the wife and the two girls) wandered desultorily in Khan Market’s middle arc – the one that most of the restaurants and cafes open their doors to. A few minutes of wandering among sated happy diners and others purposefully striding to their dinner reminded us to decide quickly, it being Saturday evening and nearly rush hour for the dinner crowd. Quickly scanning the lane for a place we had not been to before, Mamagoto (promising ‘fun Asian eating’) caught the eye. We walked up the narrow flight of stairs wondering how the place was going to deliver the ‘fun’ along with Asian eating. As we reached the first floor (they have another above), the hubbub of a busy, happy cafe hit us. Bright and colourful, looking packed to the gills with chattering customers and waiters snaking to and fro, it looked promising – the only question was, would we find a table? Luckily there was one, and a nice location too – a table for 3 in one corner with a view (ok, of the lane outside and the car park). The place had a casual, cafe-like air, more buzz-y than relaxed, and with no overt Chinese or Oriental restaurant trappings. A waiter sauntered by soon enough, greeted and introduced himself, and handed us the menu. The menu was interesting, riffing on flavours and techniques across the Orient. 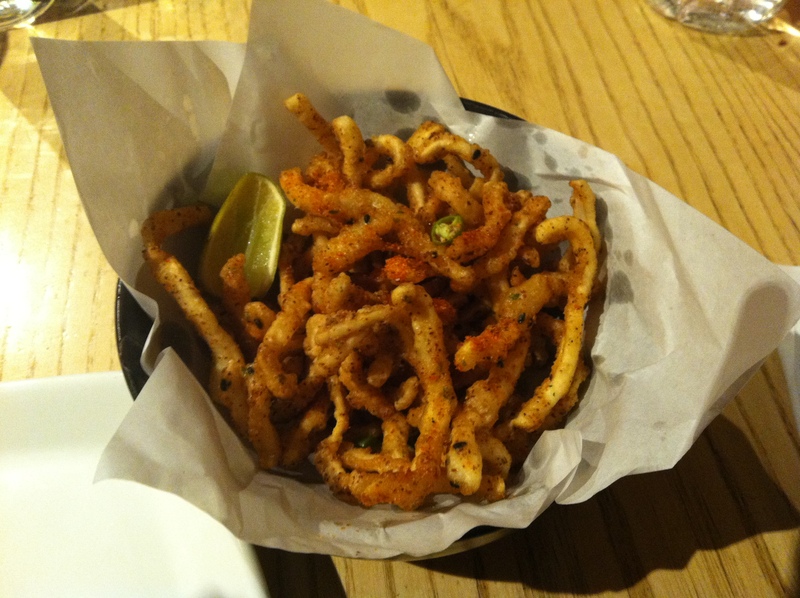 To begin with, we ordered a spicy fried calamari to go with a Mojito and a glass of white wine. It turned out to be a great choice of appetiser. The calamari was crisp on the outside, and chewy yet tender as you bit through and spicy enough without overwhelming the rest of the flavours. As we munched through what soon started looking like a meagre serving (!) it was time to order the mains. It being our first visit to Mamagoto, we wanted to sample as wide a variety across the menu as was possible for two adults and a kid (our younger daughter is a little more a year old and so doesn’t count, yet. She spent most of the evening on the windowsill – they have only one high chair for kids and it was taken – or wandering about, looking at large noisy human beings at other tables). We decided to go for an Indonesian grilled chicken with coriander and peanut dip for our elder one, and a teriyaki meal in a bowl with chicken and Chiang Mai train station noodles for us. The name of the last dish was too much to resist, and it promised a khao-suey style preparation – so I guess we couldn’t go wrong. 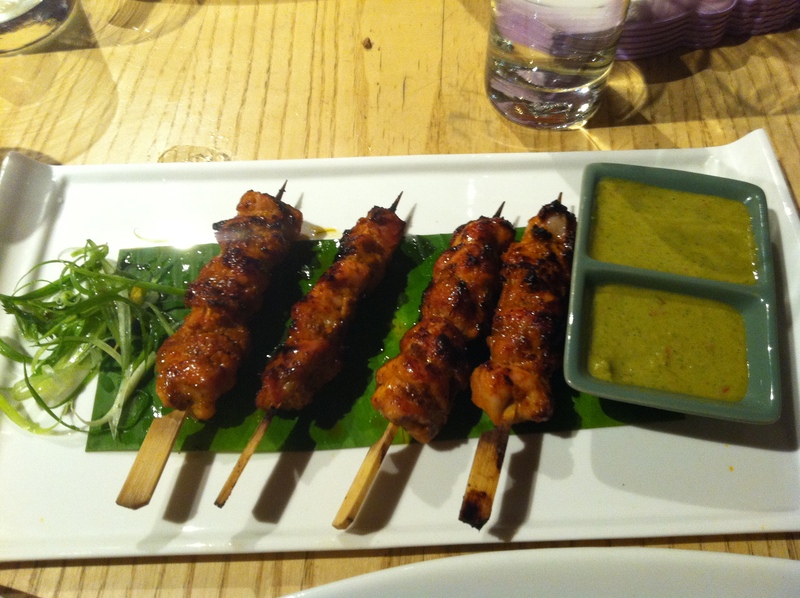 The grilled chicken was excellent, with the smokey notes of ‘tikka-ed’ chicken mixing well with the slightly sweet and pungent sauce it was cooked with. The dip was nice too, and I used it later to add flavour to my teriyaki meal as well. The teriyaki and Chiang Mai train station noodles took a while longer to arrive. While we waited, we sipped our drinks and longingly looked at the now empty fried calamari bowl, and wondered if it made sense to order another portion. And while the wine was great, the Mojito was served with ice cubes, instead of crushed ice – not sure that was an innovation that added much. Our friendly waiter was difficult to trace, and when he finally arrived to tell us that the rest of the food was almost ready, he introduced himself again. Blame it on a busy night I guess. 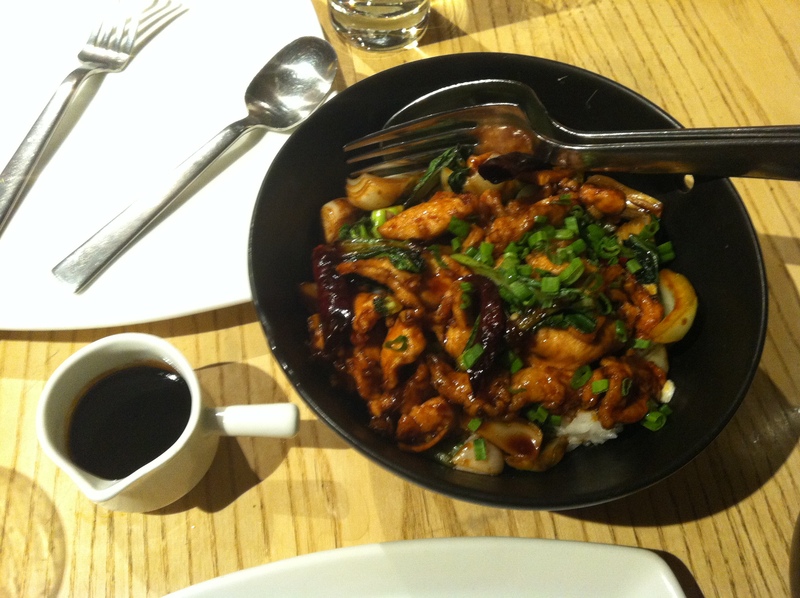 The teriyaki meal in a bowl was nice enough, with a hearty taste albeit a little low on flavour. The serving was generous and so towards the second half of the bowl I found myself reaching for the peanut and coriander dip to add some spice. The Chiang Mai train station noodles were a little disappointing – not bad mind you, but did not quite hit the notes we were expecting it to. Overall, it seemed sweeter and more tangy than it should have been, and low on the rich flavour of coconut milk (Maybe the coconuts are expensive at Chiang Mai station?). The sauce in which the noodles were cooked was quite thick, a little too many fried onions, and heavy on turmeric. Maybe the sub-conscious comparison with khao-suey affected this unfairly, but the balance of the dish seemed a little off. The buzz at the place was great throughout, with large happy groups of friends and families at most tables – the crowd starting to thin out only around the time we were leaving. Asian eating it was, with hearty portions and certainly a sense of fun. I would certainly go back for the calamari, the Indonesian grilled chicken, and to try some of the other interesting offerings on the menu.